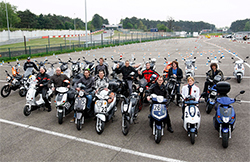 Last week apparently saw large and small manufacturers present their greenest two-wheelers and cars at Clean Week 2020 – 2012 event at the Zolder Race Circuit in Belgium. The Clean Week 2020 event also saw voting on the European e-Motorbike and e-Scooter of the Year. 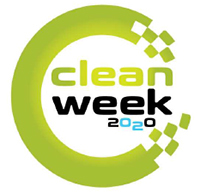 Clean Week 2020 aims at providing an annual review of future oriented technologies in the fields of mobility and environment, blended into an appealing mix of sporty, educational, technological and recreational elements. However what does this all mean for the “average” motorcyclist where is the “infernal” combustion engine heading, will we have to adapt and change in the far or near future to electric motorcycles, scooters and mopeds? No matter how hard electric is pushed, will it become the norm through acceptance or simply legislated in to our daily lives? From May 2nd till May 6th Zolder Circuit in Belgium formed the ecological heart of European mobility. Large and small manufacturers presented their greenest two-wheelers and cars and the European e-Motorbike and e-Scooter of the Year were elected. The perfect opportunity for all those interested in discovering where we stand today in clean mobility and to have a chance to admire the latest ecological technology from the front row. This year’s “Clean Week 2020” was celebrating its third full edition and the organisers are planning to carry this event on till 2020. After this year’s election of Clean Car of the Year – won by the Chevrolet Volt, Opel Ampera and Mitsubishi iMiev – for the second time as part of Clean Week, a winner was also chosen in the category EMotorbike, the E-Scooter, the E-Bike and the E-Quadricyle. While electric cars are being talked of everywhere, more and more alternatives on two wheels are arriving on the scene. A jury of twelve specialised European motorcycle journalists gathered last week in Zolder for extensive testing of all kinds of battery driven two wheelers, coming from brands like Brammo, Zero, Vectrix, IO, E-Max, Govecs, Dumco, Nimoto, Novox, Peugeot, Sens, Sym, Noveco, Emco and Solex. The prizes in the European E Motorbike/E-Scooter election finally went to the Zero S (motorbike), to the Govecs Go! 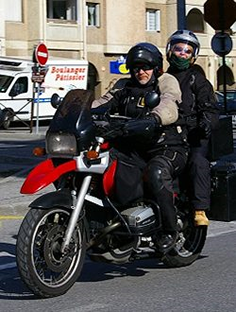 S 2.4 (scooter – 25 kms/h), the Govecs Go! T 2.4 (scooter – 45 kms/h), the Vectrix VX1 (+ 45 kms/h) and last but not least to the Nimoto City 350 (Moped – 25 kms/h). Next to the European election there was the Belgian eBike of the Year event, with participations of eMove, Gazelle, Graville, Kettler, Nimag and Sev. In the category of electric bikes, the eMove C300 model dominated, taking the best styling prize too. Finally there was the Belgian eQuadricycle of the Year, let’s say the small electrical city car, with 6 candidates for two titles: in the category “Passenger”, the Renault Twizy came first, beating the Electric Drive Budyy and the Estrima Biro. In the category “Commercial”, the spoils went to the Electric Drive Goupil G5, followed by the Electric Drive Goupil G3 and the Philco Cityfort. In Northern Ireland an ecar project is investing over £2 million in electric vehicle infrastructure which includes up to £850,000 in funding received from OLEV (Office for Low Emission Vehicles) in December 2010. The remainder of funds have been raised by the local consortium. The ecar consortium is jointly led by the Department for Regional Development and the Department of the Environment. The consortium members are: NIE, ESB, Donnelly Motor Group, Power NI, SAP, Intel, Derry City Council, Newry and Mourne District Council, Armagh City and District Council, Fermanagh District Council, Larne Borough Council. There will be public charge posts in Belfast, Londonderry, Armagh, Newry, Enniskillen and Larne. There will also be a number of rapid chargers near to major motorways. Danny Kennedy Minister for Regional Development has said: “The ecar Project in Northern Ireland, jointly led by Department for Regional Development and Department of the Environment, is set to change the way we think about transport. “While most drivers will recharge their ecars at home overnight, from today the first of what will become a fully integrated network of public charge points becomes available to everyone using an electric vehicle. The charge points provide a convenient facility for drivers to ‘top-up’ away from home, if necessary. Over 40 public ‘opportunity’ charge-points are now available in Belfast, Londonderry, Newry, Armagh, Enniskillen and Larne. Over the next year this number will increase to around 140. Special rapid chargers will also be introduced close to major roads that can charge a vehicle to 80% of its capacity in just 25 minutes. Charge Points in Northern Ireland and Republic of Ireland are fully compatible. But what about two wheeled vehicles? ecar has a dedicated website within NI Direct Goverment Services and a Facebook page and Right To Rides’ Trevor Baird asked the question on the page regarding the launch of ecar. ecar A very successful launch today! Thanks to everyone who attended and for all the enthusiasm and support! Trevor Baird Brilliant, but what about emotorcycles? ecar Trevor e-motorcycles are welcome to charge at public charge points also. All public charge points use a ‘Mennekkes’ plug (which is a 7-pin plug). I would ask your e-motorcycle manufacturer to ensure they supply you with the correct lead so you can charge at all the ecar public charge points. Trevor Baird Excellent! Although I wasn’t asking for myself, I run a motorcycle website in Northern Ireland, so it was for general information for our readers. A motorcycle is a motorcycle or a Powered Two Wheeler, however the power we have concentrated on is the combustion engine. So for any electric powered two wheelers out there this is good news that maybe they were not aware of. ecar Trevor, I would suggest you contact the manufacturer and check that the Mennekkes 7-pin plug can be used on the electric bikes to be sure that they are all compatible. So are there any emotorcycles out there in Northern Ireland? How does the infrastructure in Northern Ireland compare to that in your country? Are emotorcycle a “big” deal in your country? 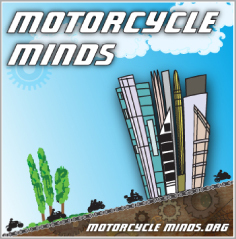 Do emotorcycles embrace motorcycling or are they a threat?